Here at Mini Mania we know speed. Our specialists have decades of racing and engine building & tuning experience and would be happy to assist you in improving your Mini's speed and performance! Give us a call at 1-800-946-2642 and let's chat. If you want to improve the performance of your MINI (2001 and later)- Click Here to go to our BMW/ MINI site. Standard Minis have always been slower than their handling was capable of. Fortunately, many people have devoted their careers to making Minis go faster. As a result, you can fit your Mini with a double overhead cam 16 valve cylinder head and programmable electronic fuel injection. Fortunately, you need not go that far to extract surprisingly large amounts of power from your Mini. Mini 1959-83 848cc 34 bhp 50 bhp Original Mini motor. 1098cc 48 bhp 70 bhp Very torquey. Same bore as 848cc/998cc. 1275cc 55 bhp 100+ bhp Start here for serious tuning. 1275cc 72+ bhp 100+bhp Easy performance boost without engine mods. 1275cc 72 bhp 100+bhp Easy performance boost without motor mods, widely available in the UK. 1275cc 93bhp 100+bhp Harder to install, "Mini Turbo" has a certain ring to it. Strong engine with turbo removed. There are other configurations, such as the 997cc Cooper and the 970cc and 1071cc Cooper S, that are not mentioned as these are too expensive and rare to be used to boost the performance of other Minis. Some car engine configurations are lumped together such as the 1300GT and Cooper S, despite the engines not being exactly the same. Differences in camshaft, cylinder heads and carberation account for the differing bhp figures for motors of the same capacity. It is often said that the cheapest way to add more power is to add more cc's. This is certainly true of the Mini - 1275cc engines are usually cheaper than extensive modifications to smaller motors, and are more tractable when giving the same amount of power. However, they are noisier and vibrate more than the smaller engines. If you have a small-engine Mini, consider replacing it with a larger car engine as your first step towards more power, as a larger engine is a better base for future modifications. Minis already equipped with 1275cc engines can be improved by swapping for one in a higher state of tune, most commonly the MG Metro engine. This method has the advantages that the engine is all-standard and there is no need to dismantle it for its camshaft and cylinder head. Modifying your Mini motor for increased power is a huge field. For more detail, read "Tuning the A-Series Engine" by David Vizard - the definitive guide, if slightly dated. Specialists can advise you on the engine spec that will best match your needs. Sometimes, it is not practical to swap an entire engine. This may be for reasons of insurance, effort required, or cost of a good quality replacement motor, or if you already have a good 1275cc engine installed. In this case, a Stage 1 kit can be fitted. This usually consists of a new exhaust, LCB exhaust manifold, intake manifold, performance air filter and replacement carburetor needle, and is available for all engine sizes. These elements are vital for future modifications and represent the cheapest methods of extracting more power from the car's engine. Expect an power improvement of 20-25% and an improvement in fuel economy. These kits can be fitted by anyone with basic mechanical knowledge. Another possible modification is to replace the carburetor with a larger one. This does not provide significant advantages for engines in standard tune but should be a prerequisite for fitting a stage 1 kit. To obtain more power than provided by the Stage 1 kit requires modifications to the engine. The next modification is generally to replace the cylinder head with one that has modified chambers and ports and larger valves - the cost of a replacement head varies according to the aggressiveness of the modifications. The next component to be changed is the camshaft. All camshafts represent a compromise between low-end and top-end power - a duration of 260 degrees is about as long as you can go without noticing a loss in low-end power. A duration of 280 degrees or more results in less power than a standard motor (or at best, the same amount), until 2000-3000 rpm for "street" cams or 4000+ rpm for race cams, where the power curve rises rapidly, suddenly providing huge amounts of power. Longer-duration cams cause the car engine to idle unevenly and require frequent slipping of the clutch at low speeds, and also cause poor fuel economy at low rpm. An engine with one of these cams is likely to develop less power than an unmodified car below 3000 to 4000rpm. In all the car can be extremely unpleasant to drive around town. Camshaft manufacturers can recommend the appropriate cam for your intended uses. Re-boring the engine is the other direction to go in to increase power. Given the expense, it is best to start with a 1275cc block. Standard overbores are 1293cc, 1310cc, and 1328cc, although the block is commonly bored to 1380cc while retaining reliability. Bores larger than this can take the motor to approximately 1400cc but bore strength is compromised. To further increase cc's the engine can be stroked - the crankshaft journals are offset-ground and smaller con-rods are used to increase the stroke. This is expensive but yields 1430-1480cc engines. 1600cc motors have been produced by this method but can only be considered experimental. The more power, the more wear on the gearbox and engine. The gearbox is mentioned first because it was originally designed for an 848cc engine delivering 34bhp and has not been significantly strengthened since. About 90bhp with a 1380cc motor is the limit for good all-round tractability and reasonable longevity of the engine and gearbox, without serious modifications to strengthen either. Even at this level, expect to replace gearboxes more frequently, and car engine life will be shortened if the car is driven hard. Around 100bhp is common. Around this amount of power, relatively expensive strengthened engine and gearbox parts must be used and low-end driveability is compromised. It is not cheap to set up a motor to deliver this amount of power reliably, and peak rpm will be somewhere around 6000rpm or beyond - an engine in this state of tune must be revved high to extract peak power. • The motor mounts from your Mini engine should be bolted to the new car engine - the old mounts can be discarded. Also transfer the engine-end mounts for the motor steadies from the old engine to the new engine. • You will probably need to transfer the inner driveshaft joints from your motor to the new motor. Note that pot-type inner driveshaft joints changed in size around 1977, so you cannot fit driveshaft ends from post-'77 into pot joints from pre-'77. • Allegro/Austin 1300 engines have larger-bore intake/exhaust manifolds that do not fit Mini exhausts. Use a Mini manifold or preferably replace with LCB plus performance exhaust. • If you put an engine with an alternator into a car with a dynamo, you will need to change the car from positive to negative earth and change the wiring, or put the dynamo on the new car engine. • A spacer may be needed before the radiator fan so that it is close to the radiator - different sizes are available. • The heater takeoff point on the cylinder head may not be drilled (Metro), or may be covered by a blanking plate (Allegro, Minis fitted with no heater as standard). This can be drilled if it is not already, and the studs and heater valve from the Mini fitted. The studs are always drilled and tapped. • The differential on Austin 1300s is usually 3.65:1. The differential on Austin Allegro 1300s is usually 3.939:1. The 3.939 diff gives excellent acceleration but you find yourself in fourth gear by 50km/h with 10 inch wheels, and revving very highly. To change the diff, the motor must be split from the gearbox so the gear that drives the differential can be changed, as well as the differential, because they are matched sets. If the differential is not changed to whatever your car was using, the speedometer and odometer will need to be recalibrated. • When swapping to a 1275cc engine, use a 1275GT bottom radiator hose. You will also need a Cooper S or 1275GT upper radiator bracket and top hose. Please feel free to contact us at 1-800-946-2642 with any questions regarding enhancing the performance of your classic mini motor. Our technical experts are more than happy to help! The overriding factor that influences just what is best for an A-Series engine is the block's propensity for flex at higher rpm, and the crank's equal propensity for flex at the same sort of rpm levels. Both combine to require a piston that is as stable as possible to maintain effective and consistent ring-seal performance. The engine number should be on a plate just below the number one spark plug. If it is not there you'll need to get the name of the mechanic who did the work. He should have details of what engine he installed and what he did to it. The other option is to take the engine apart! Ameer, The only thing that on can tell from the number is that the engine was made as a 1275cc transverse engine, and it was built late enough that the head was made for unleaded fuel. TA2DMAC, One problem with trying to get more "zip" is that after a certain point that zip is moved up the rpm range too much, and although the car is faster, you lose out at the low end and the car is not as much fun to drive as transportation...if that makes any sense. I'd suggest that a good head would be the next step, but before you get into spending more money, take some time reviewing the "Project Small Bore" articles. I currently have a 998 A series with a Stage 1 kit (Part No: C-STN17), I'm looking to move to the next stage to get a bit more performance. I was thinking either Rockers(Part No: C-AHT440) and/or an upgraded Head. However I'm not sure where to start. My 998 is in great shape, so right now an engine swap is not in the picture, nor the funds. Any suggestions to get more performance would be great. I'm not expecting miracles,just more zip out of the car. Hi found your site looking for some advice on A Series Engine for My Frogeye Sprite, I'm nearing completing of Body restoration and need to do something to the engine, Standard 948 with it is "tired", My Son has a "998" mini with a terrific engine so I would like to copy it but have a few questions. His Engine ( as the car was bought) has 1100 crank, 12G295 head with 1300gt Valves, The Block is pocketed to allow valve movement, Pistons are Austin Devon ( we are told from part number stamped on top); Twin 1 1/4 SUs, Camshaft is unknown, Appears to be standard distributor . Power output first time on Rolling road was 78 bhp and its touquey as *BLEEP* , Finally he worked out capacity at about 1150cc. So questions, is this a recognisable "period" conversion, somebody has said it sounds like a Richard Longman conversion from 1970s, can anybody confirm and also does anybody have an idea what cam would be either in it or recommended so that I can copy this spec ? veggivet. Do some searching for information about the ERA Mini sold from 1989 into 1992. It was "sort of" factory but made by ERA. Rover supplied the Mini City cars and ERA made all the changes. Less than 450 were sold. See the write up in Jon Pressnell's book, "Mini, The Definitive History". Was there ever a factory turbo option in the Mini during the later stages of the run, say in the late 80's and into the 90's? Thanks! Chris, A 1275 engine will fit onto a 998 gearbox. I am looking to put a 1275 into my 1000. Are the transmissions interchangeable? Hi I have a 1967 Austin Mini pickup with a 850cc engine # 8A-U-H 14493 and the Magic Wand 3 syncro transmission. I am going to rebuild the engine in the spring and wanted to give it a little bit more power.I was thinking of buying the 23.5 cc Large valve cylinder head p/n: C-AHT-88 and was wondering what cam do you recommend to go along with this set up and would it be worth it? I want to try and keep the pickup as original as possible so I really don't want to swap out engines. Any advise would be greatly appreciated. John, Your engine is likely an 850 (actually 848cc). 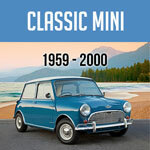 Any Mini engine (Austin, Morris, Riley, Wolseley, or just plain Mini) will fit into any Mini. There's more to it than just dropping in a new engine, however. Upgrade the radiator, different carb and exhaust, etc. 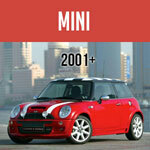 You may want to contact info@minimania.com. You could also post your question on Mini Mania's web site Forum. You'll be talking to a MUCH bigger audience than here. To you 848cc Mini upgraders: Further addition to my previous post - When completing the upgrades I have outlined you also need to fit a Camshaft bearing into the Clutch Side Housing. This is quite similar as the engine at this stage is dismantled and it is a simple fit, oh and it is also inexpensive! Dylan, You might notice that this article deals only with Minis. There is no MINI information. I'd suggest you email info@minimania.com for MINI questions. Additional information to my last post 210515: Pistons should be reduced in length, this by removing all from under the gudeon pin, so you are left with three (3) rings above the pin. The pistons should then be balanced with amounts of material removed until all equal. Compression is increased as the pistons are flat top. Many many years ago whilst engine builder for Red Well Racing I built a special mini based upon the 848cc. First I purchased 4 x Heppolite pistons 10336 as used in the A40 Austin Somerset and at +60 will take the bore to 67mm, this from 62.916 of the 848. Basically this will increase the engine size to 1058cc and creates a square engine as the stroke is 68mm therefore increasing the rev potential, of course this sets up a chain of events whereby; fuel, diff, cam etc require upgrades. I am looking to get more power from my mini . I currently run a 1275 mg metro engine , 276 cam, stage 1 exhaust n inlet , super core 2 rad . Single carb . All of this means nothing to me as I have not made these mods but I want to improve its performance and not waste money on items that won't make a difference . Any help/advice greatly welcomed . I have a 2008 mini cooper r56 hatchback non s and was wondering what I could do to it to get more horsepower any thing from 3-4 and upwards with little to no cost. The 998cc could be overbored for more capacity or it could be replaced with a 1098cc or 1275cc. You'll put a lot of money into an 848 to get it to perform like a stock 998! Boring and stroking will not turn an 848 into a 970. You could work it out to eventually get to a 998, very different engines. Decades ago there were several good books published regarding getting more power out of 848s. Look for those by Clive Trickey. No, the 4-bolt is for the big bore blocks. The article deals with engine performance. Your question would be better asked on a Mini Forum, such as the Mini Mania one, or by contacting Mini Mania at info@minimania.com. You'll need to supply more information: year of car, tire size, etc. Unlikely to be a 997. May be a 998. Rebuild advice will need to be provided by an auto machine shop, but it is likely the problem can be solved. Any engine can be put in a Mini given enough time and money, but the two you suggest are not worth the time and money; especially, in an Innocenti. Keep it original, or at least stick with a Mini engine. I have a1972 innocenti I think it has a997cc one of the cylinders got a grove about 2mm wide by1mm deep is it possible to fix? maybe bored out or sleeve please give me advice on how to solve this issue. on the other hand Ive been reading about a possible engine swap using a MG 1800(Idont know the years) or MG 1500for more powered. will a MG 1800 work with my transmission ? if it does what else is involved as far as parts and modifications are there any videos or information source where I can get more information? A head change can increase horsepower. Valve seats can be changed to take unleaded fuel. i have a '77 mini S with 998cc engine. just replaced the exhaust with extractors. Will changing the head provide more bhp and if so can the valves/seats be machined to take unleaded fuel? Likely from one of the ADO16 cars (not a Mini or Metro) such as the dual carb MG1300, Riley1300, 1300GT. Why when people want to tweek a mini do the would be boy racers suggest a vtec or twin cam mini conversion, minis are going up in value. So in 5 years or so your bodged go faster convertions will be obsolete! That or the insurance will be impossible to pay for. Just enjoy the cars.The 998 is a great engine and gives good mpg. Also if you find one a 1098 is worth having with i little bit more torque. Bigger bore exhausts only give you a head ache over a distance. Save your money for petrol for mini shows. Most minis handle better than thier drivers can drive so just enjoy them. Can any one help i bought a 1970 mini cooper s with numbers with plate number XADI 180976A & N20D-429A i know they started from XADI 34 - 45 i dont live in the uk so was wondering if export numbers were diffrent ??? Hi Guys! Me and my boy (6) is thinking about buying an old mini 1275 Clubman with no engine. The plan is for us 2 to build up a pocket rocket in our extra time. Looking at something like a twin cam, turbo charged motor and obvious another gearbox as well. Any ideas I will really appreciate. Cheers!!!!! You're on a web site that sells Mini parts! Use the SEARCH feature to look for PARTS. Seach for "stage one". Regarding the pistons: it depends. Usually you would be OK unless you are running an engine with very high compression and the new head has smaller chambers. Can't think of a reason you have to change the crank. fmeyu, This article is about Minis. Not about MINIs. Note the car listings at the top of the article. Your question would be more appropriate on a MINI Forum...and will certainly get more attention. I have a 2013 mini one with 1600CC and 98HP engine. I heard that it is pretty easy to convert that to the 122HP. you need to replace some sfuff and thats it as it is the same engine. Can you say if it is feasable and parts do I need? you say fit a vtec like its a run of the mill replacement the amount of work (or cash if paying for a conversion) is HUGE! i am a mechanic who works for toyota so i do no what im talking about & i am also a mini owner. the amout of wiring alone will be a mamouth job and fabricating the front subframe to hold the engine is no easy job. and buying one already done is £1200 - £1500. if your just wanting a quick and easy way to improve power for a small engined mini just put a 1275 with a stage 1 kit but if your wanting more, then just follow this guide on a 1275 and i would strongly advise if anyone does bore out there block then seriously only go to 1380 unless you are willing to plow money into your baby because all you will do is blow heads, head gaskets, gearboxs, eat clutchs and destroy pistons because lets face it all that power? your not going to drive sensibly! and joe i would advise a full system because on ebay you could probably pick up a full system for about £150 but that may need abit of mechanical knowledge because for a total amateuer its not going to be easy i would advise getting a quote from a garage for fitting at the most they will charge about an hours labour which would average out about £35 - £60 and the system you will be best suited with is the center exit dtm twin back box it looks great and sounds awsome hope thats helpful! Racing clutch,lightened flywheel,and a lowering kit..
hi im looking to put a deep sounding exhaust(like a rally or boy racer sound) on my mini city 1.0 1984 im not very clever with cars so would i just have to buy the backbox and clamp it on or replace the whole exhaust , i also want the exhaust end to be centralized instead of on the left as curently i hav a little pea shooter exhaustt ,, need help please ?? Lucy, no way of telling what is wrong without lots more information about what "tryed everythink" includes. Yes, it is possible the "head has gone" but it would be more likely a head gasket has failed. You might try getting someone to pressure test your cooling system for you, and look for signs of oil in the water or visa versa. hi can any1 tell me why my engine is boiling? i have tryed everythink...i think it could be the mini head has gone..if it is do u think its best to get a new engine or replace the head on my mini?? Is there any one who can give me a step by step guide to boost my 1972 mini engin? and what is the most bhp i can get from it?